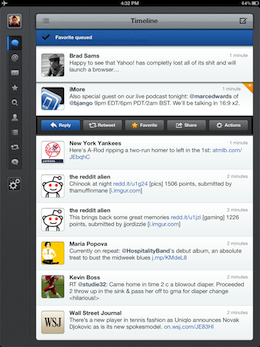 The popular Twitter client Tweetbot has been updated with a nice array of tweaks to the already great app. Specifically, this build brings offline favorite and ‘read later’ queuing, improved local tweet search and other improvements. We’ve been testing the app for some time and one of the fan favorites will probably be offline support for favorites and sending articles to read later services. This is especially handy when browsing your Twitter queue on a WiFi iPad while commuting, or on any device in areas of low coverage. When you tap on a star or send a link on, you’ll just get a pop-down badge that indicates your action has been queued up for later transmission. Very nice. There is an updated search view that brings a bunch of other changes. You can now see tweets near you, one of my favorite features of other clients that I always wished would come to Tweetbot. 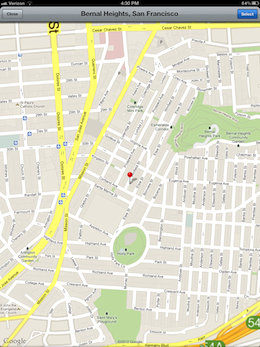 You can change your location at will if you’d like to see tweets centered around a location that isn’t yours. There are also location-based keyword searches available and there’s a new Top Tweets option in the browse section, where the Trends and People categories have been moved. You can also change your trend location right from the search view. Some new handy shortcuts have been added. Double-tapping the Search tab will launch search with the cursor in the field and the keyboard ready to type. Swiping to the right on profile views also now takes you back up one level. A two-finger swipe down gesture on any maps or views of webpages will now close them as well, which is cool. If you’re a heavy Twitter user who’s also grammar conscious, you’ll be happy to see that there is now support for smart quotes, ellipses and converting ‘–‘ to em dashes, which makes it quicker to type these bits of punctuation properly. 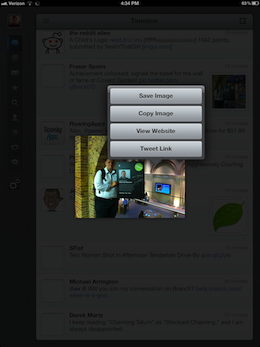 Images now display a few options when you tap and hold on them, for easier access to manipulation and sharing. The muting options have gotten more robust as well, with the ability to mute keywords as well as individual accounts and clients. Muting a client will mute all mentions that come from them as well as tweets. There is also now support for regular expressions. The new version of Tweetbot doesn’t change anything major about the way that the app works, so if you were a fan before, you’ll still be a fan. 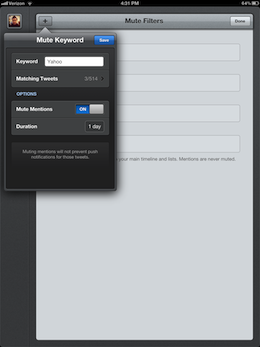 And if you preferred Twitter for iPad or another client, that might still be the way to go. But we still feel Tweetbot is one of the most robust Twitter apps out there for iOS period and this update just makes it that much more powerful.